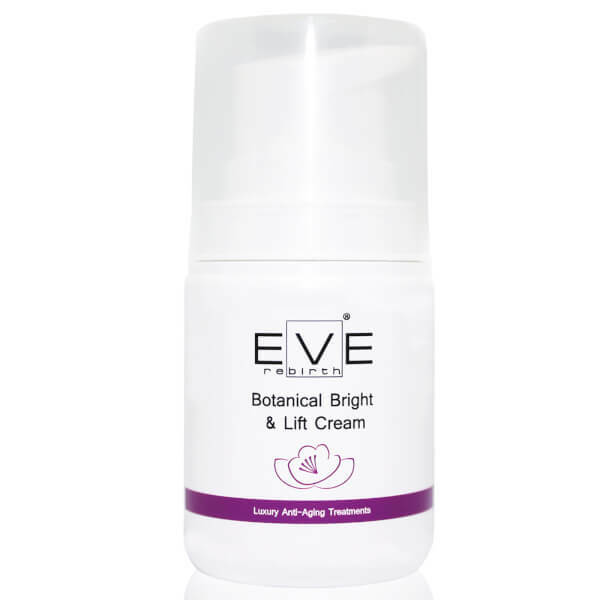 Replenish and rejuvenate with the Eve Rebirth Botanical Bright & Lift Cream; an anti-ageing, antioxidant-rich moisturiser dedicated to hydrating, softening and illuminating your complexion. Infused with a host of beneficial ingredients, including Mullein Extract, Wheat Bran and Organic Olive Oil, the lightweight, quick-absorbing formula defends against environmental aggressors and deflects harmful UV rays to create a luminous glow. A nourishing blend of Calendula and Linden deliver toning and plumping properties to leave skin looking smooth, firm and radiant. Apply a small quantity of product every morning and evening on a well cleansed face and neck. Massage with circular movements until completely absorbed. Aqua (Water), Echinacea Pallida Extract*, Hydrolyzed Wheat Bran*, Malva Sylvestris Leaf Water*, Olea Europaea (Olive) Fruit Oil*, Coco-Caprylate, Glycerin, Lauryl Olivate, Sorbitan Olivate, Cetearyl Olivate, Cetyl Palmitate, Diheptyl Succinate, Sodium Hyaluronate, Tilia Tomentosa Extract*, Calendula Officinalis Flower Extract*, Tocopherol, Achillea Millefolium Extract*, Hydrolyzed Verbascum Thapsus Flower*, Sorbitan Palmitate, Helianthus Annuus (Sunflower) Seed Oil, Xanthan Gum, Citric Acid, Glyceryl Caprylate, Sodium Stearoyl Glutamate, Sodium Levulinate, Sodium Anisate, Sodium Phytate, Glyceryl Undecylenate, Parfum (Fragrance), Capryloyl Glycerin/Sebacic Acid Copolymer. *Biological Ingredient.